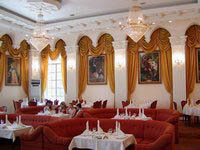 The restaurant «Bahor» in Tashkent, Rubric It's interesting, Tours to Uzbekistan. The restaurant «Bahor» is the sight of Tashkent, was built in 1958, it is also monument of culture of Uzbekistan. Here you will be able to experience the atmosphere of the East, enjoy the magnificent show program on the big stage of the famous restaurant, which is accompanied by a variety of dance numbers. 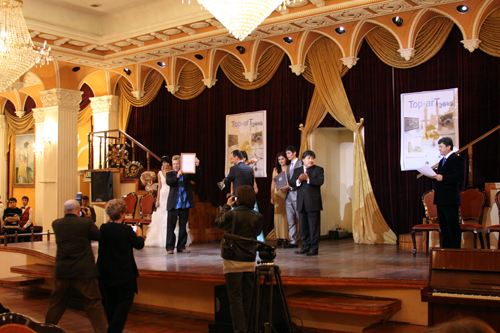 From 9 to 10 pm singers of the restaurant "Bahor" sing various repertoires in live performance. There are often famous people, noble people circle. In the restaurant “Bahor” you will spend an unforgettable evening in beautiful surrounding. Address: Tashkent, street Istikbol, 8. Recommended dishes: mampar, crispy chicken, carbonara. Show-program: from 9:30 pm. to 10:30 pm. Working hours: from 12:00 am to 12:00 pm.